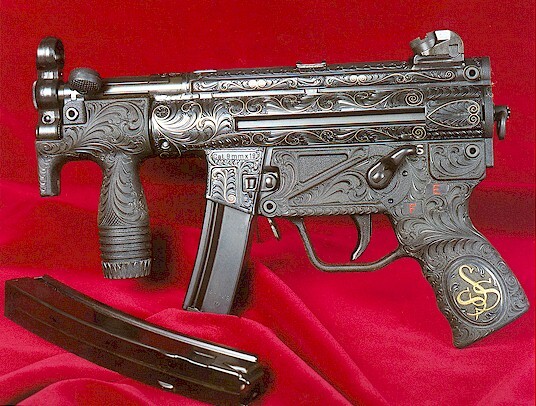 The MP5K, a Maschinenpistole in the purest sense of the word. 'K' in German stands for Kurz, or 'short.' 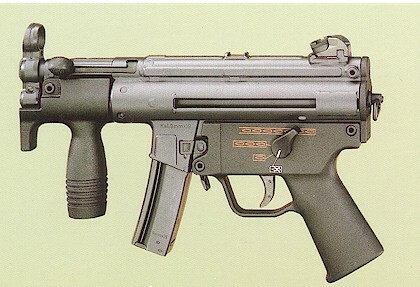 Introduced in 1976, the MP5K was designed at the request of HK South American sales rep, who saw a market for dignitary protection and increased firepower in a small package. 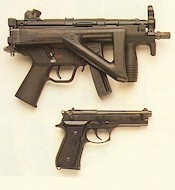 The K saw relatively insignificant sales compared to the full size MP5. That is until the advent of a shoulder stock addition and a new variant name called PDW in 1991. PDW stands for Personal Defense Weapon. The PDW shoulder stock is manufactured for HK by Choate, and the stocks are applied to the K models in the United States. 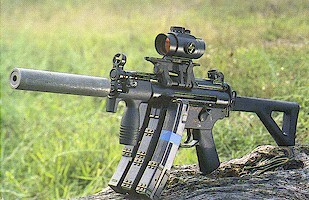 With the new shoulder stock, sales of the PDW soared, mainly due to the new controllability of the MP5K. It was now on a par with the full size MP5 in controllability. One other difference of the PDW over the K model is the threaded three lug barrel reminiscent of the MP5 series. Now sound suppressors could be fitted to the K in addition to any other MP5 muzzle accessory. 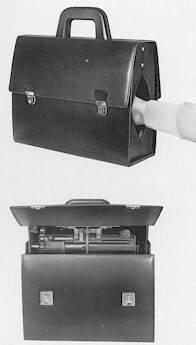 No description of the K would be complete without mention of the briefcase. One of the hottest setups for collectors, the briefcase has limited applications for VIP protection, other than being very discreet. Difficult to fire accurately, the briefcase can easily put bullet holes into the calf of the firer, should he decide to fire the K on full auto while holding the case normally. Can you picture it? 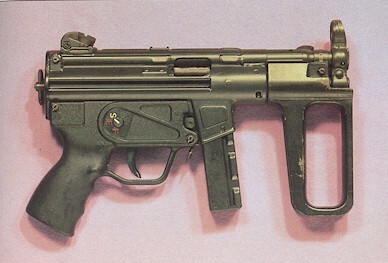 First prototype of the MP5K, produced in 1976. The first version of the foregrip was made of wood, and was subsequently reduced in size to aid in concealability. This foregrip was made from wood. 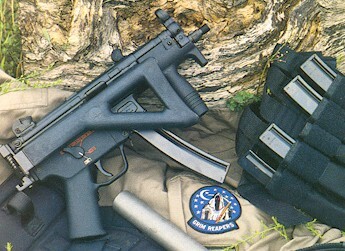 First prototype MP5K, serial number 0001, manufacturing date of 1976. 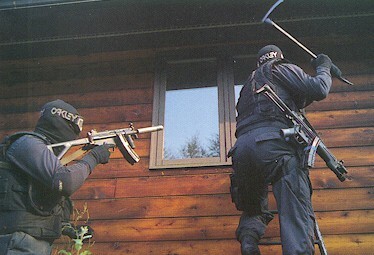 MP5KA4. The designation is for a standard K model with three round burst trigger group. Another variant with only a small post front sight and no rear sight is called the MP5KA1. With a burst group on the KA1, it becomes an MP5KA5. 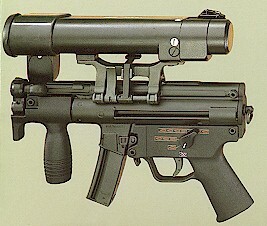 The MP5KA5 with obsolete aiming point projector. 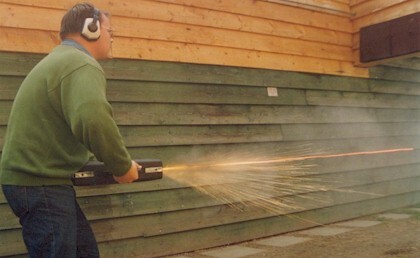 Without the burst group, the gun would be designated MP5KA1. Notice lack of rear sight and small post front sight. 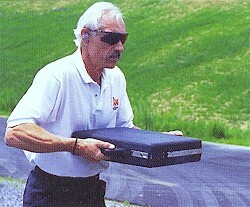 Mark Kunnath from HK International Training Division demonstrates proper technique for getting the most potential accuracy and safety from firing the briefcase. 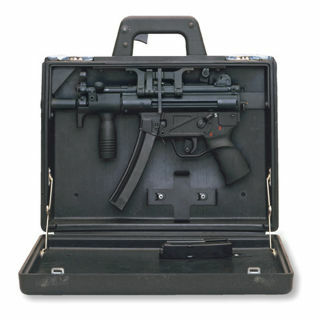 Rarely seen "bag" for carrying the MP5K inconspicuously. 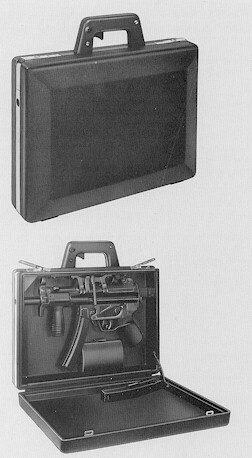 Like the briefcase, it can be fired while inside the bag, by inserting the hand and gripping the gun normally. The only apparent example of this bag that I know of is in the Grey Room at HK/Sterling.